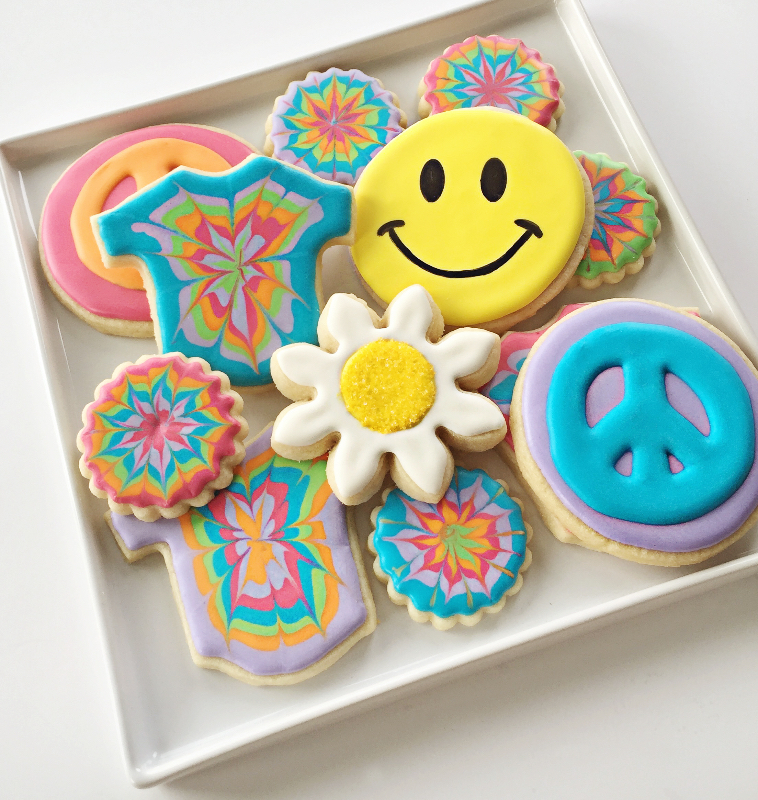 When I think of the 1960s, I think of happy faces, peace symbols, daisies, and tie dye -- all of which I created in cookie form to celebrate two special 60th birthdays. These are made using my FAVORITE SUGAR COOKIE and ROYAL ICING recipes. The colors were inspired by Wilton's "Peace Flower" mini baking cup set, which I used on the matching cupcakes. I really love the way these cookies turned out, but I have to say, making them was a nightmare. Definitely my fault for getting ahead of myself and deciding to try new decorating techniques when I really didn't have time to do so. I guess I've been really fortunate up to this point, because I've never had anything go so completely wrong before. That's what I get for being smug. As you can see from the picture below, the cookies on top are tie dye perfection. The cookies underneath these are my Pinterest fails. I tried a new decorating method called "dry brushing"; instead of awesome tie dye effects, I got loathsome tie dye effects with a side of pitting and dull finish. The problem was, these looked great while I was decorating. I completed about 30 of them and, exhausted, decided to go to bed and finish the rest in the morning. I woke up to this and had to start all over again. The good news is, I think the new versions turned out even better. The lesson here? Definitely try new things...just don't try them 48 hours before you have to deliver four dozen cookies and cupcakes for a joint birthday party. I got the Peace and Happiness Stencils and Flower Icing Decorations from Copper Gifts. The Peace Symbol Cookie Cutter is from Cheap Cookie Cutters. The happy faces were created using the Happiness Stencil listed above and a combination of Wilton and Americolor edible markers. I used the Wilton first to trace the eyes and mouth and the Americolor to fill them in for a nice, deep black color. The sanding sugar daisy centers were applied using a dry application. Read more about this on my YOU ARE MY SUNSHINE COOKIES blog post.